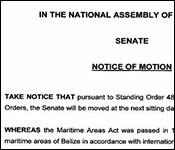 Belize-Guatemala relations are back in the news tonight after the Opposition, PUP, announced that they are going to push for the Maritime Areas Act to be amended. Now, as this law currently stands, Belize is only claiming 3 miles of territorial waters between the Sarstoon River and the Ranguana Caye. Under international law, Belize is entitled to 12 miles, but the Maritime Areas Act was passed with us not claiming those 9 miles of sea. That was done as a means to provide for a framework for negotiating an agreement on the territorial dispute with Guatemala. Since those negotiations have failed, experts on international law have advised that the law needs to be amended so that Belize can claim its full 12 miles of territorial waters. The rationale is that a claim for all territorial waters under international laws strengthens the country's case, if the territorial dispute should actually go to arbitration. You'll remember that Ambassador Assad Shoman, Belize's foremost authority on all things connected to the Belize/Guatemala territorial dispute, was agitating for this change when he was in Belize last year. But, apart from his discussion, and a few mentions in different parliamentary debates, nothing came of this suggestion. So, the Opposition believes that the time is ripe to push for the Maritime Areas Act to be amended. They will be allowed, at the next sitting of the Senate, to put a motion forward for the amendment to be debated. It is not known whether it will succeed or fail, but as far as we're aware, this will be the first serious attempt to make this change. 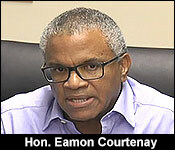 "At the last national party council meeting at the end of September this year, a resolution was passed for us to commence a claim in the Supreme Court seeking a declaration that sections 3 and 7 of the maritime areas act are invalid and have no force of law, which is something that we intend to do, but we also felt that we should move the national assembly since the government has been sitting down doing nothing on this issue and so we prepared a notice of motion. We studied the standing orders, we prepared a draft of the amendment. We took some advice on the proposed amendment and we sent a letter to the national assembly on the 20th October asking for it to come up at the last senate meeting." "They took the position that the 4 days' notice was not met, because we sent it on the 20th and the meeting was on the 25th [October] and so they refused to put the motion on the agenda." "I wrote to the president and said well if that's you decision, can you assure me that it will be on the next senate meeting, since more than 4 days would have elapsed. This morning I got a reply from the national assembly that it will be on the agenda for the next sitting of the senate." "So the procedure will be that the motion will be proposed, seconded, debated and if it is passed then the bill will be introduced as an item for debate at the senate." "Sir do you foresee, you are the advisor for the PUP, or the senators foresee that the government will resist this motion?" "I have no idea why the government has not done this. I am sure that the government had seen the advice that we have seen, where the government of Belize was advised that if the Belize/Guatemala dispute was not going to be resolved by negotiations, then one of the first things to do is to amend the maritime areas act to protect Belize's interest and to claim all our territorial sea and all our exclusive economic zone as provided by international law." "The government has not done it, we believe that it should be done and so we have decided that this along with other issues on the Belize/Guatemala issue we are going to be pushing forward." "I can only assumed that if the government wants to be nationalistic, if the government wants to be patriotic, it will fully support the PUP and support our leadership on this issue." "Speaking of support, has this motion been brought to the social partners or the business community within the senate, along of this particular application?" "We have Senator Thompson has done some consultation among the non-governmental senators and so far we have been getting full support for the motion that will be moved at the next senate meeting." "I would hope, the only senator I believe that we have not yet spoken to is Senator Rocke. I would that the church would see its way to raise the Belizean flag, to be nationalistic and patriotic and not be political on this issue and to support the motion. We dare the United Democratic Party to vote against this. A vote against this is a vote against Belize." "I don't think that we should make our policy and our decisions based on the way Guatemala is going to react. We must put the national interest first and foremost and keep it first and foremost at all times. Not subjugate it to whether or not somebody a nice foreign minister or somebody gets along well with another foreign minister." "The issue here is what are we to do to protect our national interest and to ensure that our legal case is strong in the event this matter were ever to go to the ICJ." "I have not given any thought to what Guatemala response would be, but I can tell you this: I can only expect that they will not like it, because our advice is that this is something that should be done in order to protect our interest and my interest and our party's interest is the interest of Belize and so we need to do what is right." We'll be there at the next Senate Hearing to see how this one plays out.